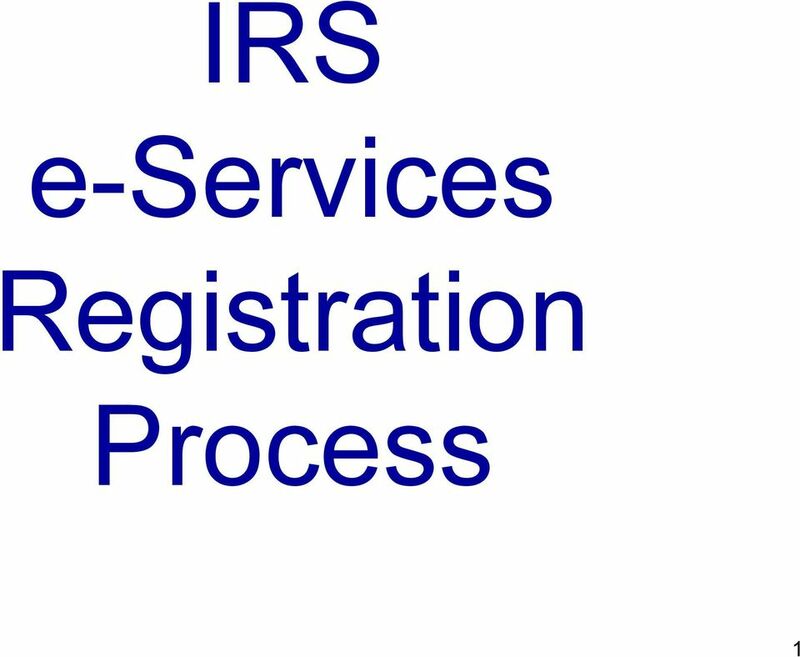 Download "IRS e-services Registration Process"
9 Follow the field construct for Date of Birth and Phone Number. Use your Adjusted Gross Income from your current or previous tax year. 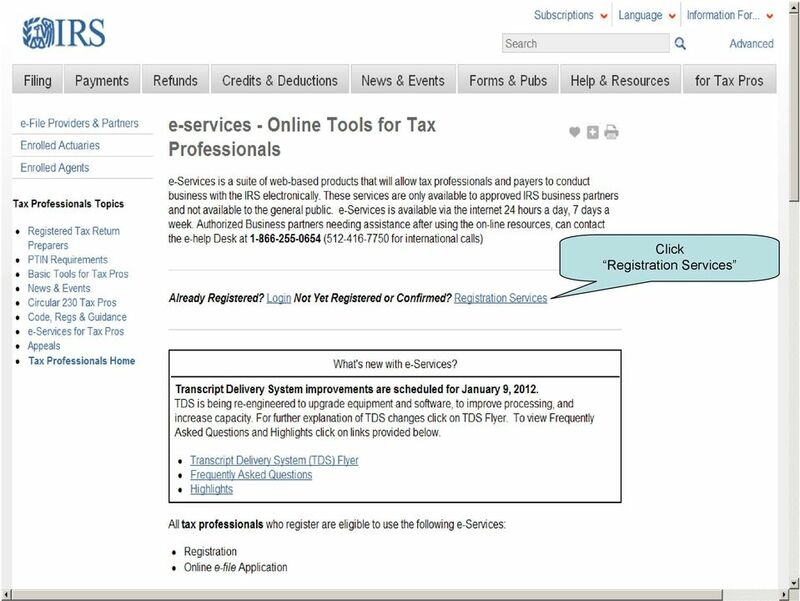 The drop down menu shows three years to allow for early filers in the new tax year. 10 Follow the rules provided to construct your Username and Password. Your Password is case sensitive. Write down your Username, Password, Recovery Question and PIN and keep them in a secure location Never share your information with others or allow them to use your information. Your password expires every 180 days. Your PIN does not expire but it is a good idea to change it periodically. 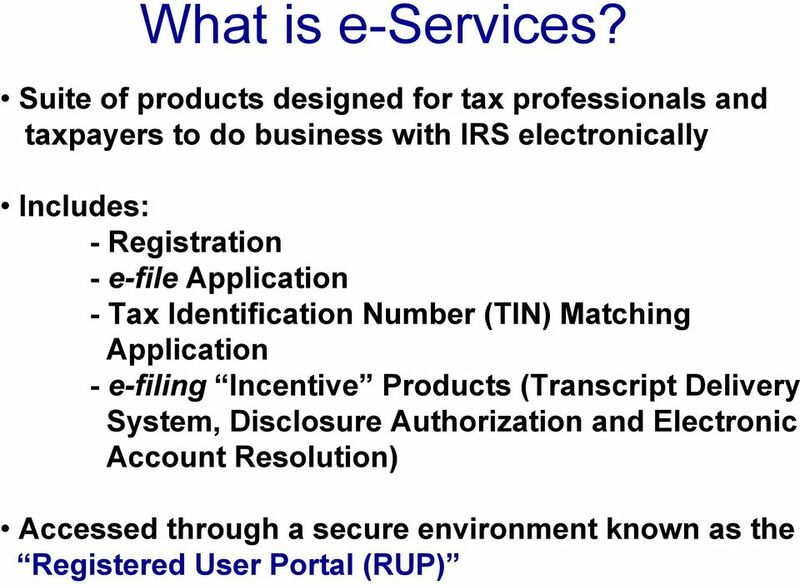 11 With e-services Registration, you are able to change your official address of record with IRS. 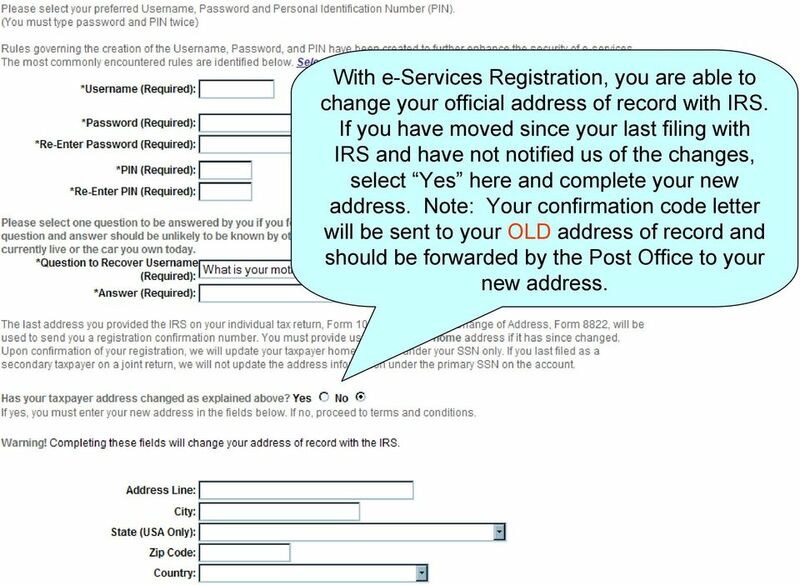 If you have moved since your last filing with IRS and have not notified us of the changes, select Yes here and complete your new address. Note: Your confirmation code letter will be sent to your OLD address of record and should be forwarded by the Post Office to your new address. 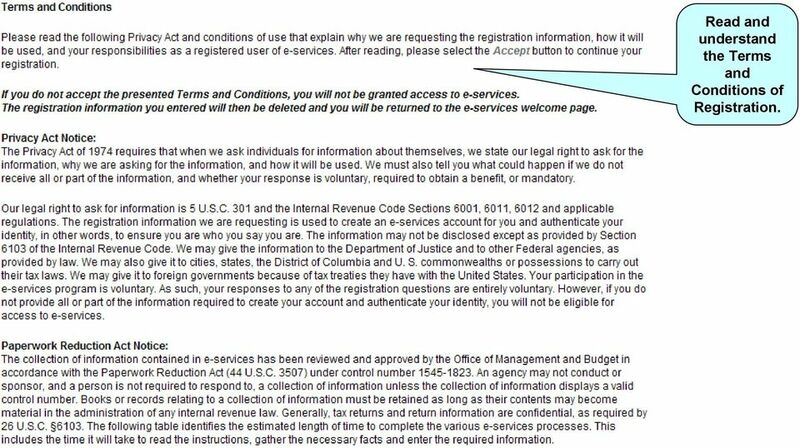 12 Read and understand the Terms and Conditions of Registration. 14 Click Accept to submit your registration. 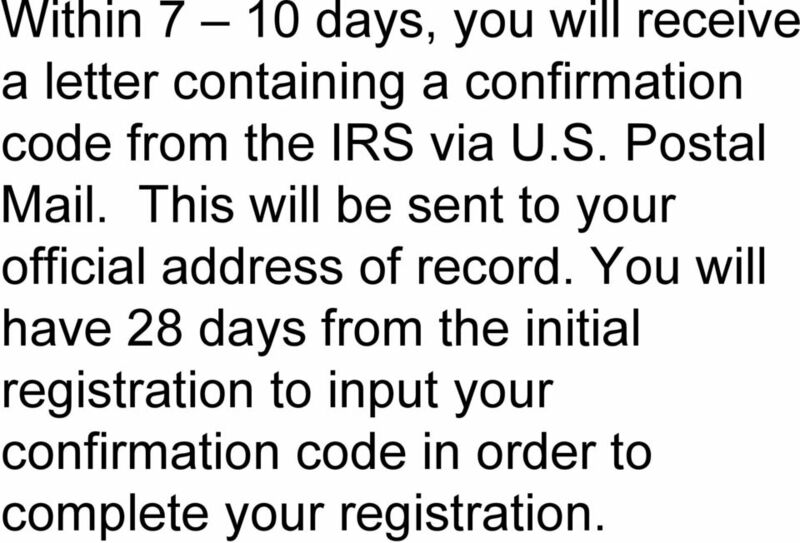 15 Within 7 10 days, you will receive a letter containing a confirmation code from the IRS via U.S. Postal Mail. This will be sent to your official address of record. 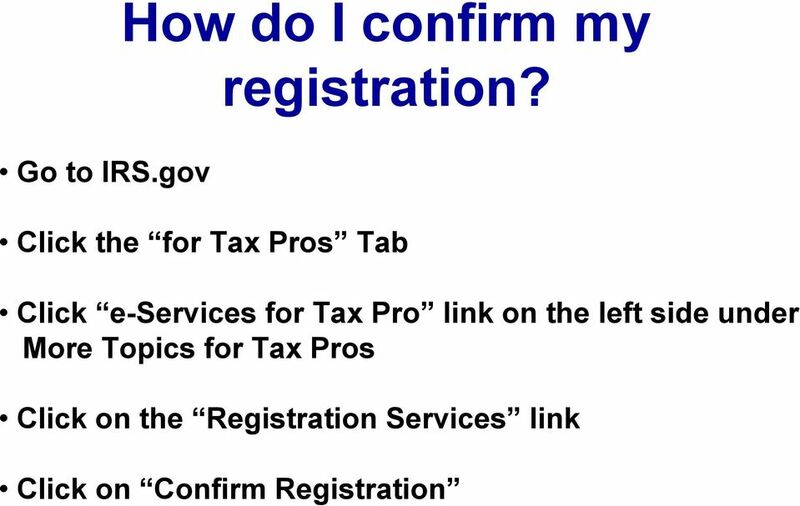 You will have 28 days from the initial registration to input your confirmation code in order to complete your registration. 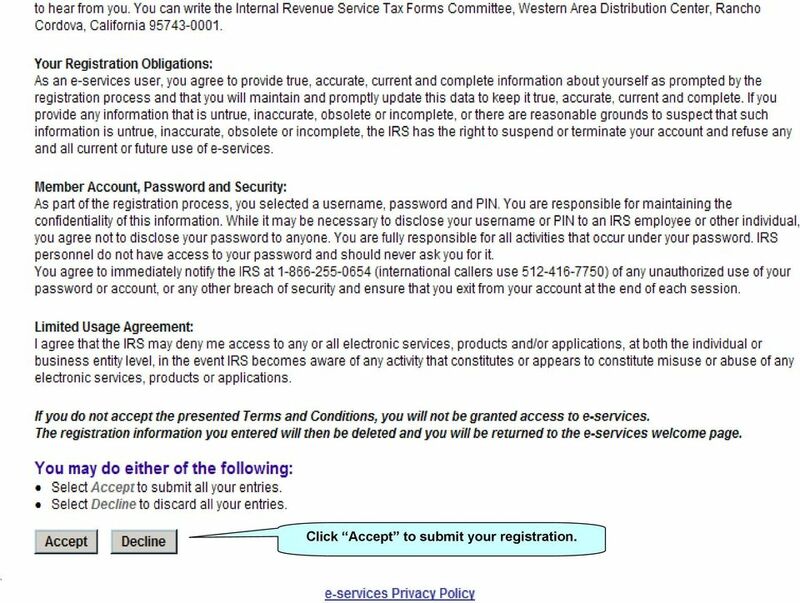 18 Click Confirm Registration Confirm Registration: Select this option to enter the confirmation code you received from the IRS. You should only have to complete this process once, however if you ever forget your password or PIN, you will need to repeat this process. 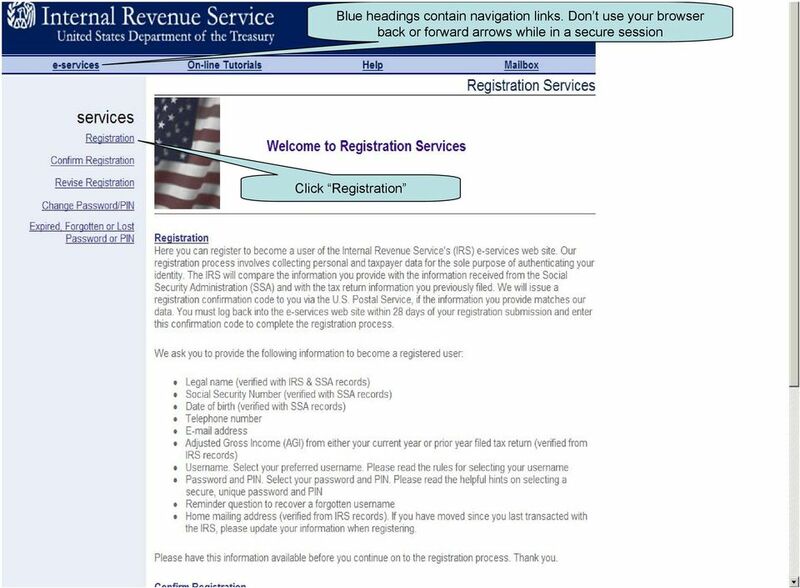 Revise Registration: Selecting this option will allow you to revise the information in your Registration record, such as name, telephone number, address, and address. Change Password/PIN: Use this option to change your password, PIN or both. Forgotten or Lost Password or PIN: Allows you to request a new confirmation code to reset your password if you ve forgotten or lost your password. 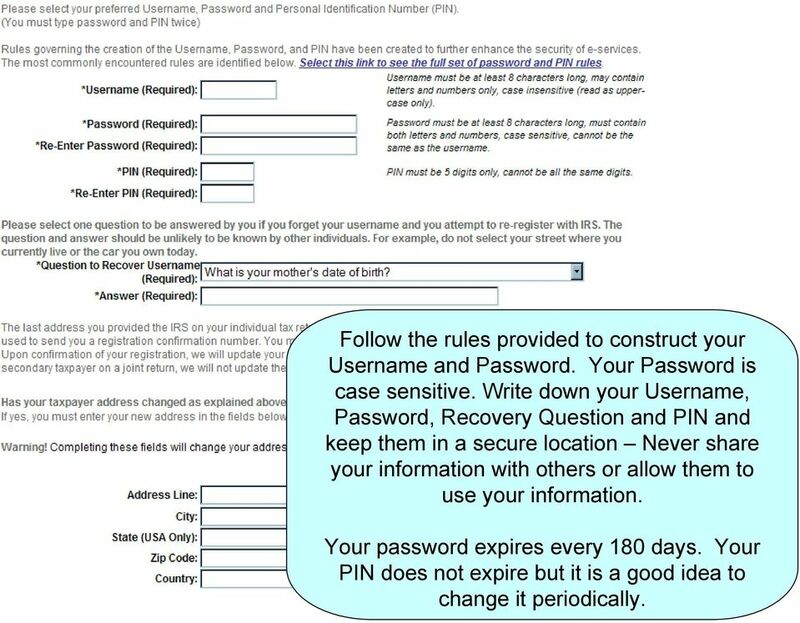 If your password has expired you may login through the Login link on the e-services home page with the expired password and you will be prompted to change it once you ve entered your AGI and PIN. 19 Enter the Username and Password you created when you registered. 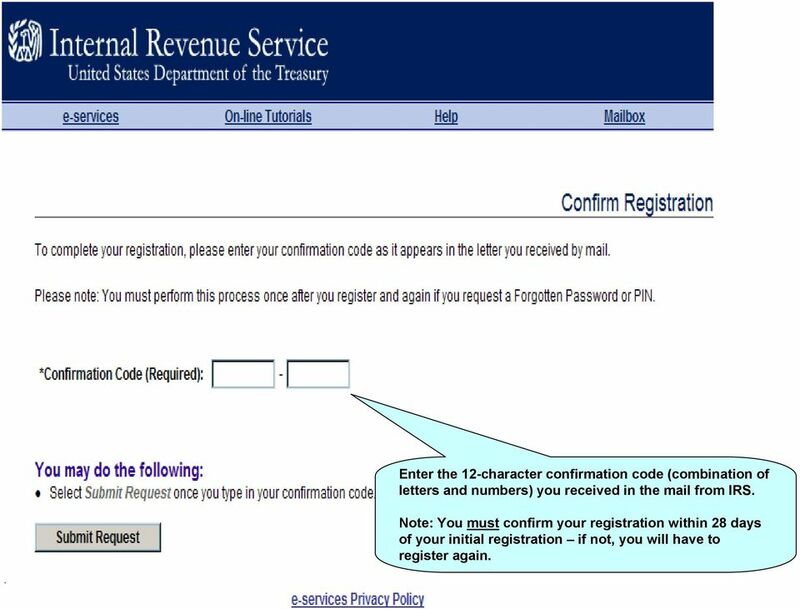 20 Enter the 12-character confirmation code (combination of letters and numbers) you received in the mail from IRS. Note: You must confirm your registration within 28 days of your initial registration if not, you will have to register again. 21 For security reasons, e-services passwords expire every 180 days. 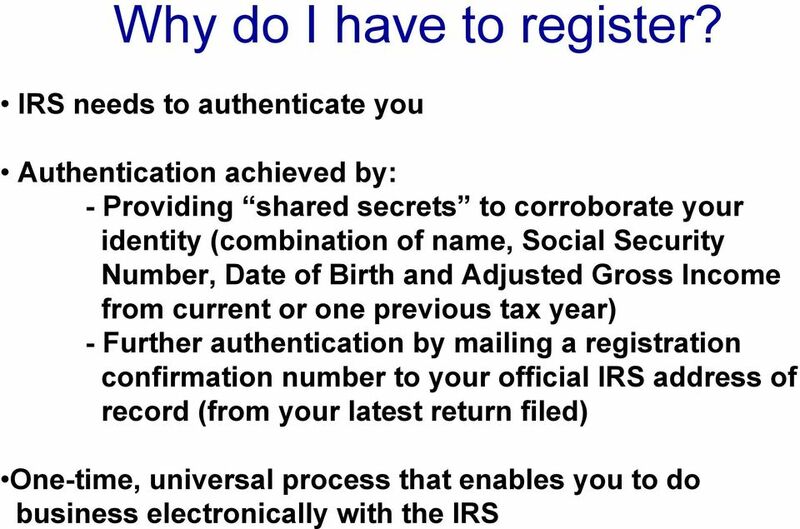 15 days prior to expiration of your e-services password, the system will advise you when you log in. 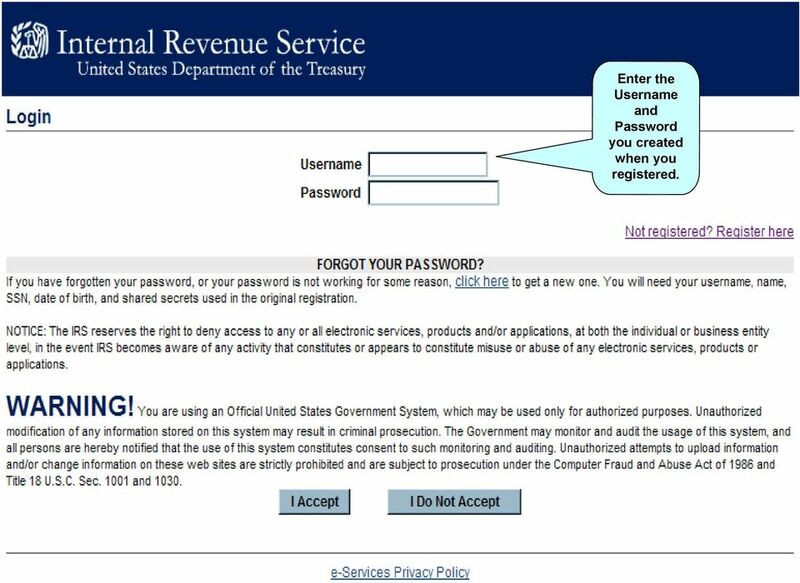 10 days prior to expiration of your e-services password, IRS will send you an . 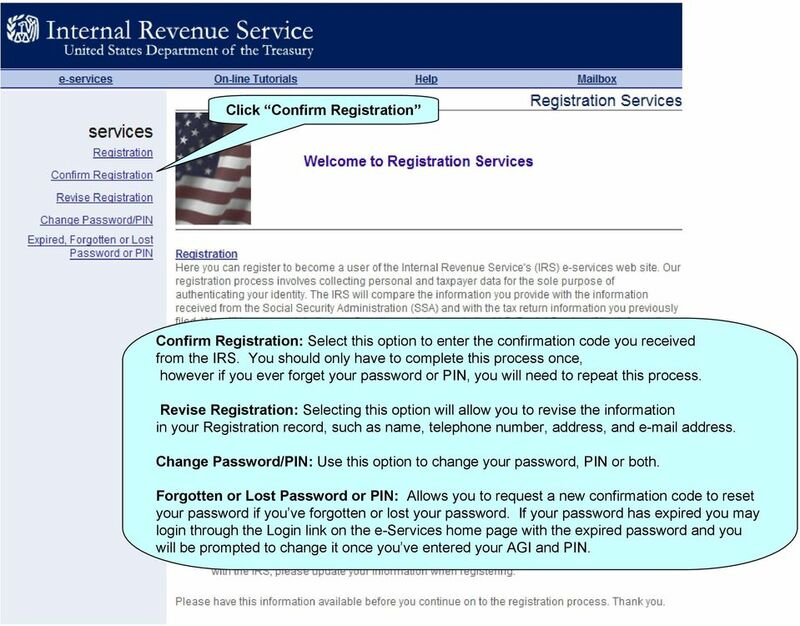 Set your own reminder to log in to e-services and change your password if you did not provide an address during registration. 22 If your password expires and you still remember it, you may login using your expired password and you will be prompted to enter your AGI and PIN, You will then be prompted to change your password. If you have forgotten your password, you will need to go through the Forgotten Password link and wait for a confirmation code. 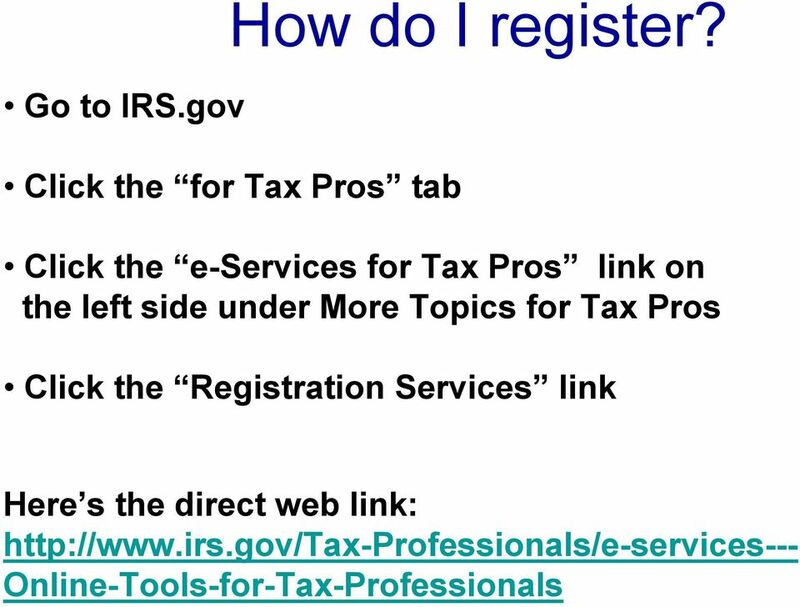 IRS Tax Return Transcript Request Process Tax filers can request a transcript, free of charge, of their tax return from the IRS in one of three ways. 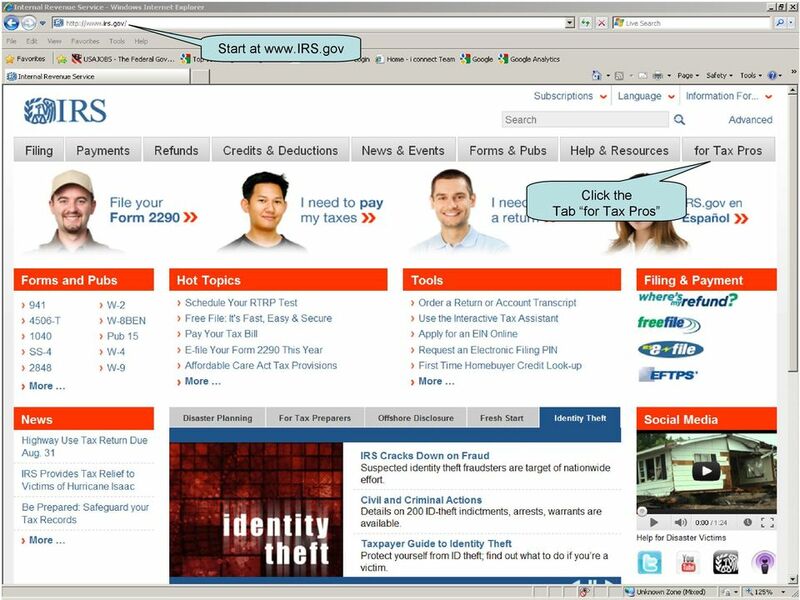 Online Request Available on the IRS Web site at www.irs.gov. EASTPOINTE SECURE E MAIL SYSTEM SETUP INSTRUCTIONS In order to send and receive protected health information (PHI) on consumers between Eastpointe and your provider agency you will need to do the following. How Do I Status My Vendor-Owned Resources in ROSS? How to set up your NMC Online account 1 Introduction NMC Online is a secure service which allows you to manage your registration with us online. 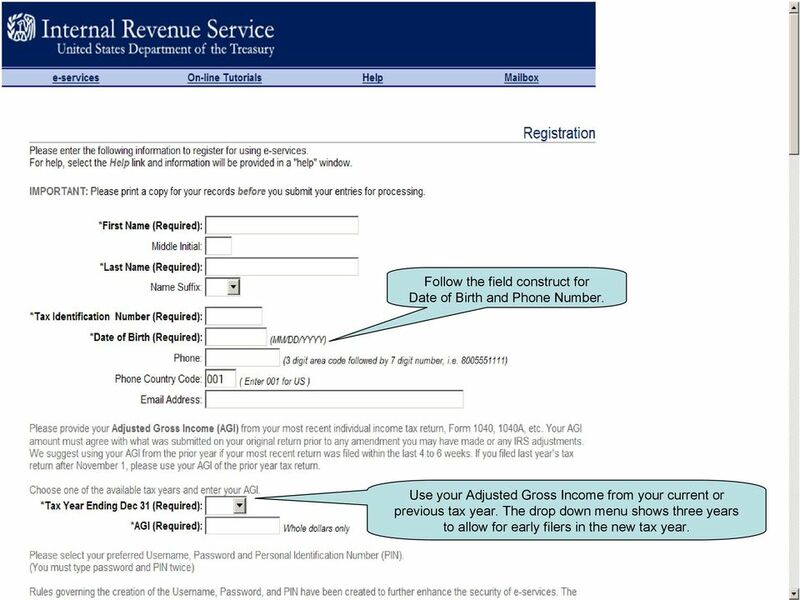 This guidance explains how you can set up your account.
! "#$ Stonington Public Schools Parents Guide for InfoSnap Online Enrollment. for Returning. Students. August. Online Enrollment. 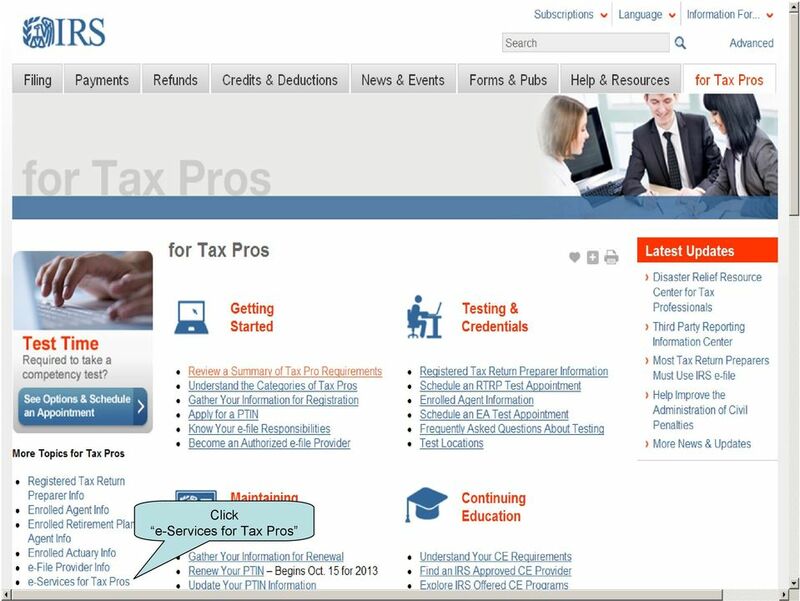 Within this interactive PDF you will find all the information about the Electronic IRS. This document is not an offer, commitment, representation or warranty by AT&T and is subject to change. 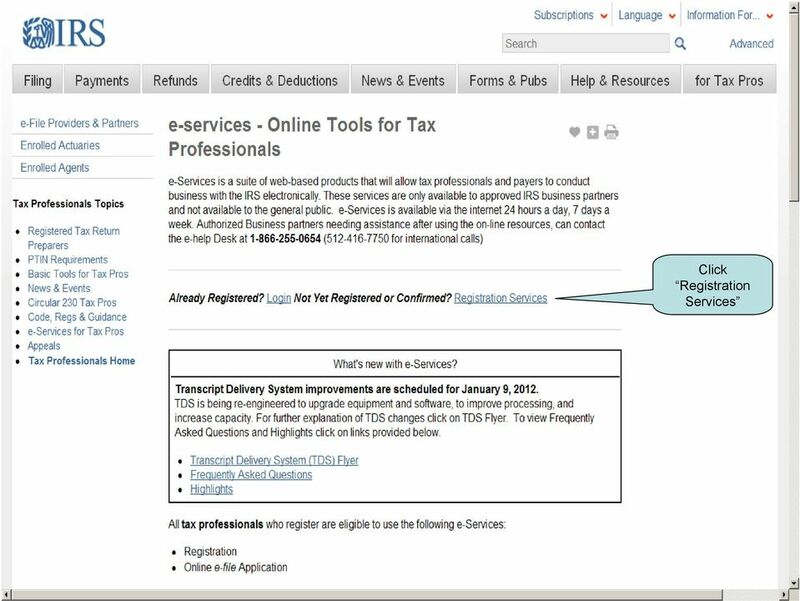 IRS Tax Return Transcript Request Process Tax filers can request a transcript, free of charge, of their Tax Return Transcript from the IRS in one of three ways available on the IRS Web site at www.irs.gov. 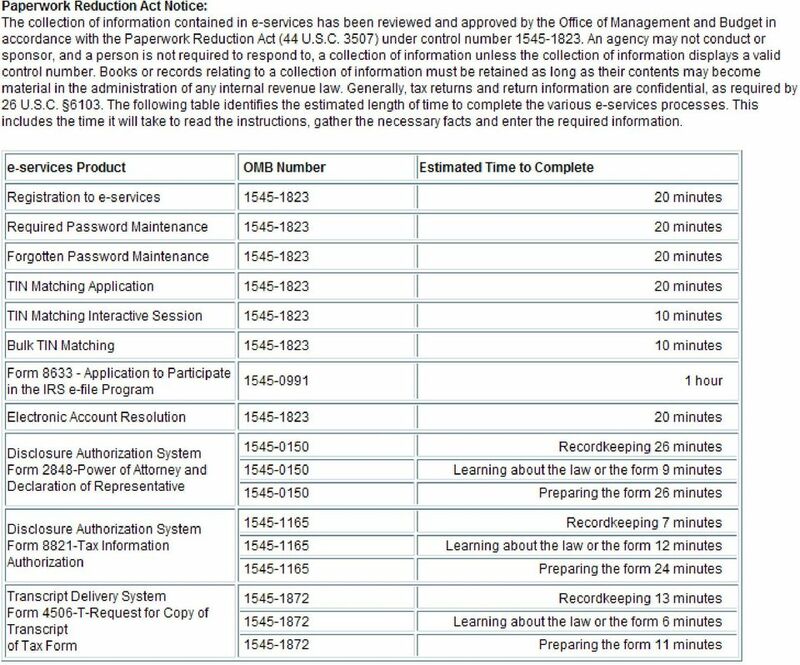 georgia tax center Quick Reference Guide 1 Table of Contents 1. Forgot Password or Username.. 3 2. Create a New GTC Profile.. 4 3. Register a New GA Business.. 5 4. Add Accounts to my GTC Profile. 6 5. The site also provides self-guided product demonstrations, basic service information and support contact information. Hello, my name is Annmarie Tracey and I am from the New York State Department of Taxation and Finance and I work in the taxpayer contact center. Add Title Single Sign-On Registration Registration Instructions for Single Sign-On (SSO) Create SSO User ID Create SSO Password Subscribing to CHAMPS Accessing CHAMPS Step 1: Open your web browser (e.g. How do I enroll in the password portal?